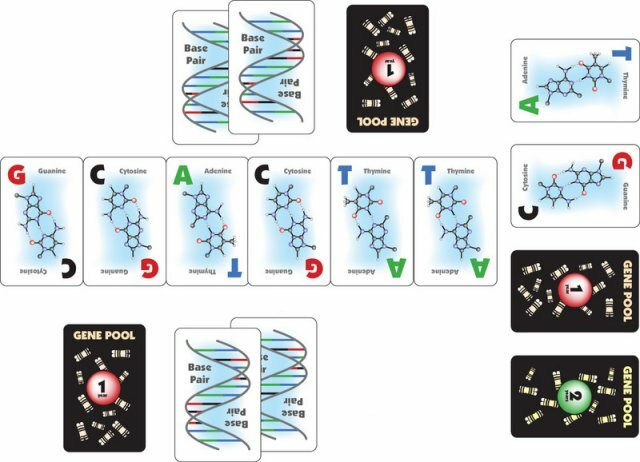 Join the fight against rare genetic diseases by becoming a DNA engineer in Gene Pool, the new fast-paced mind-bending card game! Use strategy and spatial thinking to mutate, invert, delete and insert your way to success! You will be competing with your opponent to repair important genes of various length and difficulty with gene therapy. Make these repairs by modifying and rearranging a common DNA sequence. Your current genetic research goals are private, and are only revealed when they can be found within the DNA sequence. Continue repairing genes until one player completes enough research to win the Nobel Prize in Physiology or Medicine and the game! This is a fun little puzzle game published by the game's creator. The quality of the components is excellent. The rules are simple and there is plenty of information on the cards and on the rule sheet, which makes the game educational as well.